If you've ever sat in a wheelchair before you know that self propulsion can require a lot of energy, especially if it involves difficult terrain. Since operating a wheelchair requires the use of one’s hands, complications may arise involving the fingers, wrists, and palms. Overtime, blisters, calluses and sprains may occur if your hands are over strained. For this reason alone, it is highly recommended to invest in a pair of decent gloves for your hands as this will massively reduce the amount of pain received. When looking into a wheelchair glove, there are several key factors that should influence your purchase. First on the list would be protection. As stated before, calluses, blisters, and strains are common when operating a wheelchair. The glove’s primary objective would be to prevent these things from happening. The glove should be made of sturdy and long lasting material that won’t quickly wear out or decay. Up next is flexibility. At the cost of more protection, many types of gloves give up the feature of flexibility. This can be a big problem for many individuals, especially for those who suffer from limited arm strength. The operation of a wheelchair requires a a pretty broad spectrum of hand gestures, many that require a lot of movement. If a wheelchair glove is too thick, the trait of hand dexterity is lost, along with maneuvers that you would be able to execute with it. Grip is another very important feature that must not be overlooked. In order to even turn the wheels of your wheelchair you must be able to tightly grasp the wheels to rotate them. It is important to look for gloves that have a good level of grip, especially in the key areas where the gloves make contact with the wheelchair as these are most important. One problem that many wheelchair users often complain about is breathability. Irritated, sore, and sweaty hands are a direct result of wearing gloves that aren’t breathable. This is an important factor that you really do not want to overlook. This trait can single handedly dictate your comfort level when you are wearing these gloves. Something you should pay attention to is the amount of support that is given by your glove. 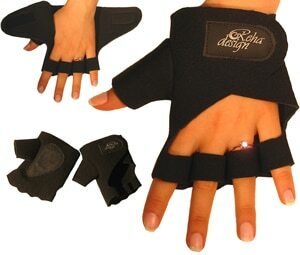 Since your hands are going to be put under intense strain, it would be tremendously beneficial to add supportive characteristics to the glove you are wearing. 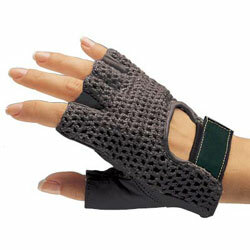 Support to the hand and wrist will drastically minimize the risk of injury. When it comes to the material of the glove, there are usually two main types of material you are going to be choosing from. Amongst the most popular of choices comes leather. Both tough and durable, this material has seen widespread use in gloves of all types. Leather gloves are for the most part resistant to tears and punctures whilst also being flexible and waterproof. Another type of metrical would be lycra. The main advantage of having a glove made of lycra is its elasticity. Lycra is not as strong or durable as leather, but what it lacks it makes up for in comfort by providing a much wider range of movement and ease of use to put on and take off. Another feature you should consider looking at is whether your gloves are full length or cutoff. Both of these options are popular styles of gloves available on the market today. As stated before, operating a wheelchair requires a high level of dexterity. This does not necessarily mean that you should get the thinnest glove you can find. If you’re looking for a glove that can have many other uses besides just for the wheelchair, it would be recommended to cutoff gloves. For this style the upper part of the fingers are free to move with no restriction allowing much more freedom to the fingers. Of course, with this benefit, you give the up the warmth and protection that your fingers would have otherwise gotten with the full protective gloves. Location would be a key factor in which type of glove you should decide to purchase. Since the exposed fingers have no protection, they are very susceptible to cold or wetness. Most of the time the trade off between movement and protection is worth it but if you’re looking for a pair of gloves that will get your through very harsh conditions, it would probably be advisable to purchase the fully enclosed gloves. Padding is an important aspect of any glove worth purchasing. Most of padding inside a quality glove will be thick and protective. Padding is often made out of rubber but it is not uncommon to find different gloves offering gel padding. Good padding is necessary to prevent blistering and calluses—the most common problem for wheelchair users. This article went over some of the key factors you would want to look into while purchasing a pair of good quality gloves for your wheelchair. Hopefully some of the features and characteristics that were mentioned will be of importance to you if you are currently in the gloves market.